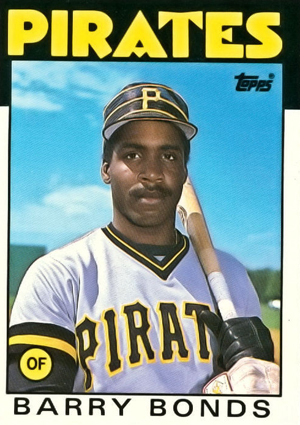 At one point, 1986 Topps Traded Baseball was one of the crown jewels of 1980s baseball card sets. Time, scandals and easy availability have brought it down several notches. However, there's still no denying the star power of the loaded checklist. The roster of 1986 Topps Traded Baseball rookie cards is a roll call of greats from the late-80s through the mid-90s. Barry Bonds, Jose Canseco, Bo Jackson and Will Clark all have rookies in the set. The second tier includes Wally Joyner, Andres Galarraga, John Kruk, Bobby Bonilla and Kevin Mitchell. The design maintains the one introduced in 1986 Topps Baseball. Card fronts have a black bar at the top with a stylized headline for with the player's team name. The player photo has a thin frame with the position in a circle at the bottom. The player's name stretches across the bottom of the card. Card backs have a 'T' suffix with the number and are printed on brighter card stock than the flagship set. 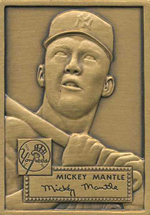 Dealers ordering cases received a bronze mini card reprinting the 1952 Topps Mickey Mantle. The heavy card measures 1 1/4" by 1 3/4" and recreates both the front and back of the card. Given to dealers ordering cases. Card measures 1 1/4" by 1 3/4". Reprints the 1952 Topps Mickey Mantle card.